My favorite teacher was my High School English Teacher, Mr. McKinnon, every semester I signed up for one of his classes, my favorite was his creative writing class. He strongly believed to become a better writer you need to read a lot of everything. And throughout High School he literally brought literature to life for me. His lessons went well beyond the classroom. 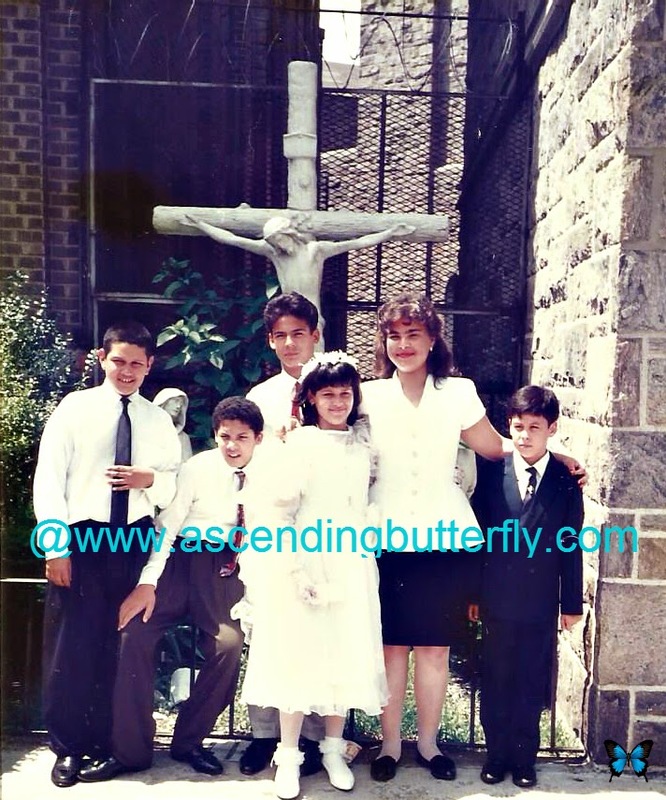 Sorry it's so blurry, this was pre-digital days and not a DSLR camera. 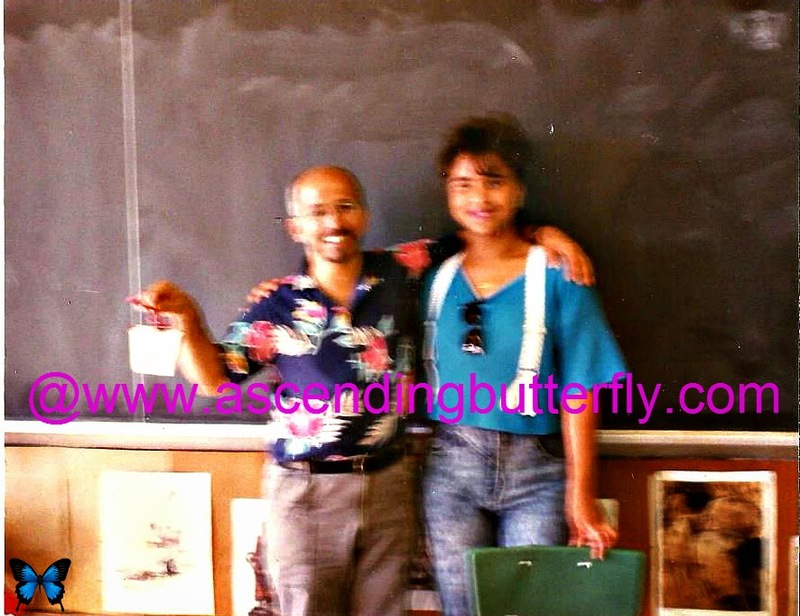 By my last semester I had completed most of my required classes and took a service class with Mr. McKinnon so I spent a period each day helping my favorite teacher, but mostly picking his brain, he spent his summers and sabbatical in Hawaii and I was fascinated with all the great stories he told me about living out there. The day this picture was taken was Senior Year and the last day of school, and while I was all smiles I knew I'd miss Mr. K! But he did give me lessons I took with me. That same year I went on to teach in my Church, I was pretty young and was assigned the Special Education class. I did have moments of doubt, wondering if I was up to the task. I had different ages, grade levels and had no idea how I'd get each student on the same page, but I remembered my favorite teacher and knew the only way I had a shot was by making learning fun. One of my students was actually taller than me, and he is seated in this picture! I think they probably saw me more as a big sister than a teacher. While teaching was one of my most rewarding jobs, after College I switched gears and with my Degree in Mass Media Communications in hand, I went from writing for Newspapers, to Local News on Television, and then oddly back to print again, working for several well known Magazines for a time. The one thing I do remember is just how much teachers have to spend to operate their classrooms, and sadly these are expenses that are not reimbursed. Teachers just don't make enough money to have to constantly dip into their own pockets to supply their classroom's basic needs. 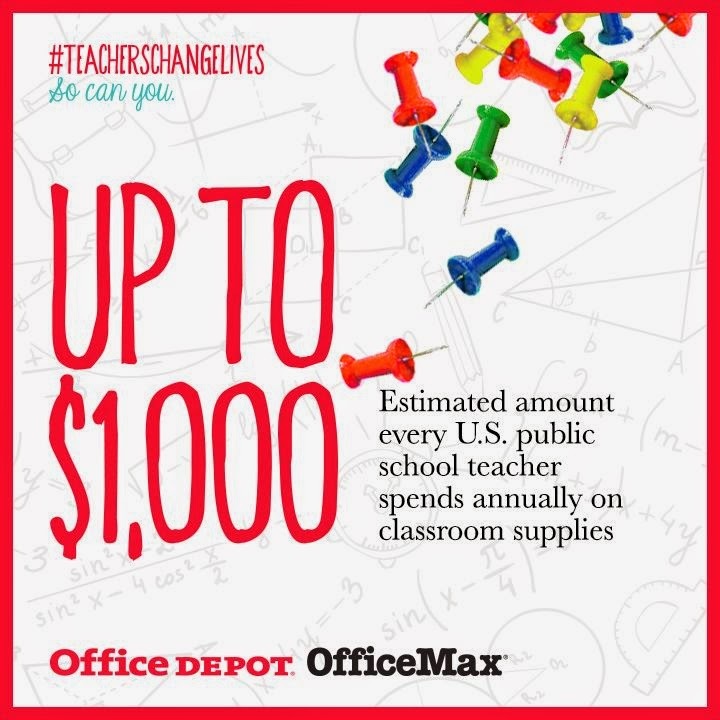 Ƹ̵̡Ӝ̵̨̄Ʒ - Office Depot and Adopt-A-Classroom have partnered to raise awareness about teachers and all that they do in the lives of students. Ƹ̵̡Ӝ̵̨̄Ʒ - Click on the red box that says "Register Your Classroom", this will take you to the Adopt-A-Classroom website and Follow the rest of the steps. Ƹ̵̡Ӝ̵̨̄Ʒ - Click on the Teal Colored box that says "Donate to a Teacher" and Follow the rest of the steps. Win a $500 Gift Card For You AND Your Favorite Teacher! Ƹ̵̡Ӝ̵̨̄Ʒ - Scroll down the page to the blue box that reads "Enter to win a $500 Gift Card For You And Your Favorite Teacher" - Fill in the First Name then Last Name and press "Get Started" - it's that easy! Enter to be one of five lucky winners! HURRY! The deadline to enter is May 4th! (also check out the 'give 5% back to your school (on select supply purchases)' initiative! I've experienced the joy of learning from a great teacher, and in the short time I was a teacher I hope I was able to inspire my students, because they certainly inspired me. Teaching Special Education was difficult but rewarding, I learned how to sign so I could communicate with my deaf students. I personally think Teachers are our biggest heroes and they don't get thanked nearly enough. I am going to enter, and if I am lucky enough to win, one of my local schools will definitely be getting the Office Depot Card inside a Thank You Card for all they do for our students every single day! What teacher or classroom will you donate to if you are selected as a winner? Great picture's of a young butterfly in the making It's easy to see that your love of helping others started at an early age. Wonderful of Office Depot for this program.Teachers are the line in helping our children grow and they are not paid enough for there efforts !! @Big Happy Buddha - That is one of the main reasons that drove me from teaching, as a single girl in the city it just wasn't enough of a salary to make ends meet. I certainly don't regret a moment, but am glad I found a different way to apply my degree is Mass Media Communications! I completely agree! They are huge heroes! People don't acknowledge it enough! They shape and mold the minds of future generations! @Jennifer Shelton - Teachers are definitely heroes and their efforts sadly often do go un-acknowledged.